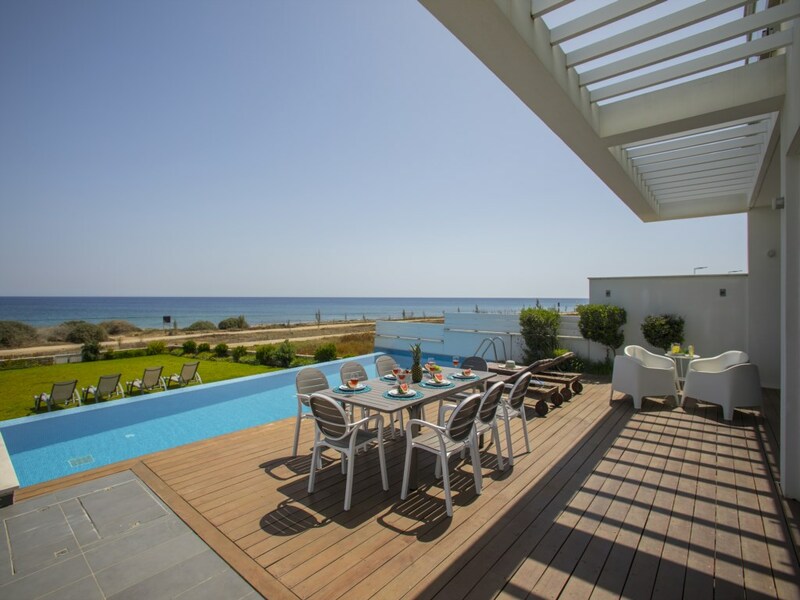 Villa Eponine, a unique and modern seafront property, designed, furnished and equipped with top-notch luxury and the ad most care to detail. The minimal and modern design, the colors and style of the Greek island house and the breathtaking views of the crystal clear blue waters of the Mediterranean are the characteristics of this beautiful house. For your own comfort and peace of mind the whole house is fitted with a state of the art security and fire alarm. Eponine is fully air-conditioned and there is also under-floor central heating individually controlled in every room, free Wi-Fi internet and satellite TV with English and Russian Speaking channels. Villa Eponine is a seafront property located in a quiet area of Protaras between Mouzoura beach and Ayia Triada beach near the Crystal Springs Hotel and only 2 minutes’ walk from a child friendly sandy beach. At Central Protaras only 2 kms away, there can be found many beautiful beaches and the famous Fig Tree Bay and Sunrise Beach with lots of water sports on offer like water-skiing, windsurfing, pedalos, diving, canoeing, para-sailing, fly fish and just about any watersport you may want. Protaras also offers a plethora of good local and international restaurants, pubs, cafes and a thriving night-life in the summer months. 1. Listed Prices include 350KWh of electricity per week which is more than enough for normal use of the house. Additional electricity consumption is charged at Euro0.30/Kwh. 2. For stays shorter than 5 nights there is a surcharge of Euro250 over and above the total booking amount.